Vietnam Beauty Via Lotus Flower Lakes In The Whole Country part 2. If Japan has cherry blossoms as national flower, tulips in Holland, white lotus in India, Vietnam chooses pink lotus blossoms as the national flower. Travel Vietnam, along the S-shaped land, you can encounter different pink lotus ponds. Vietnam-online saw elegantly beauty through the lotus ponds, had visitors seen yet? Like many other lotus ponds across the country, just in summer, lotus flowers in Hue blossom. Tourists will admire many lotus lakes along the citadel with the lotus fragrance. 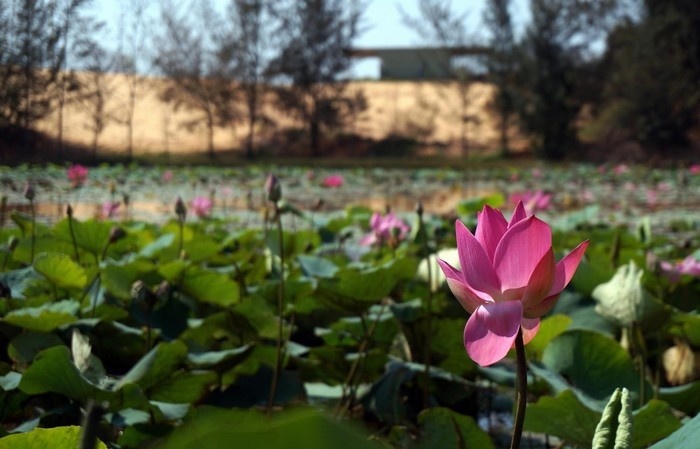 Lotus flowers are mainly grown in the area of ​​Hao Citadel that surrounds the ancient citadel in the south city or on Ngu Ha river crossing ancient stone bridges and two sides of Tinh Tam lake. Originally, lotus flowers in Hue have white color. Recently, due to hybrids between the white ones with the dark pink ones, they turn into pink color. 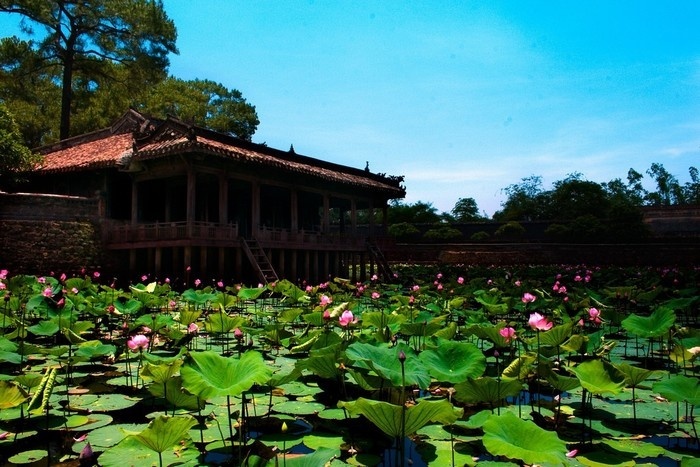 This makes the lotus pond in Hue more attractive, white color in the pink color, the pink color in the deep green color of young lotus leaves. 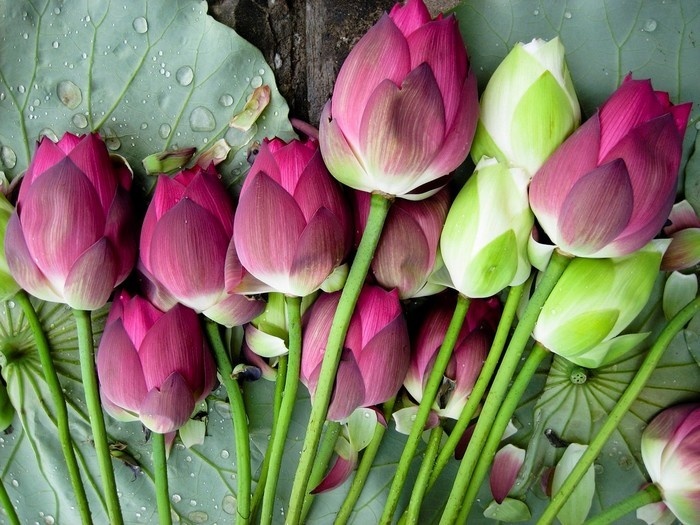 Lotus blossoms in Hue are elegant, beautiful, smooth, aromatic and very fragrant. Visiting Hue lotus ponds, tourists can buy cheap bundles of lotus flowers at the price of VND 15,000 – 20,000 / bundle. Lotus flowers help your space more elegant and cozier. One more lotus pond places that tourists can certainly less known it is the lotus ponds in Binh Thuan. 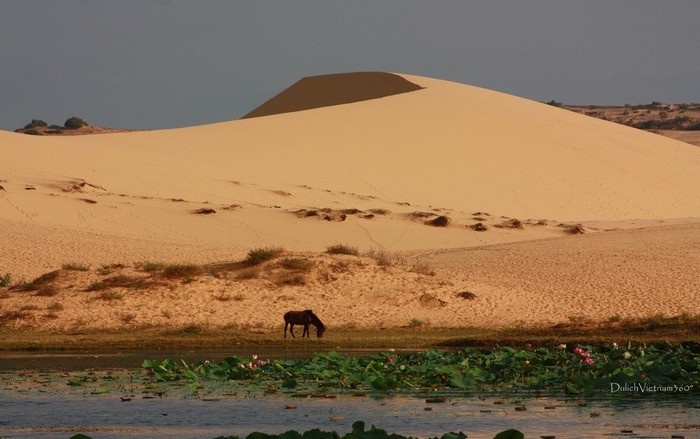 Lotus Lakes in Binh Thuan have something special that it is located next to large sand dunes. Bau Trang is a famous destination which is about 60 km from Phan Thiet city, is the only freshwater lake in Bac Binh district. Bau Trang is divided into two parts by a horizontal hill running through, named Bau Ong (Mr. Lake) and Bau Ba (Mrs Lake). Bau Ba is surrounded with a lot of lotus flowers. Such these lotus flowers are planted for seeds and roots. It really created a special scene ever “lotus blossoms and sand dunes” side by side. This especially honored the elegant beauty of the lotus pond! The unique scene honored the elegant beauty of the lotus pond! Despite not too flashy, lotus flowers of Vietnam have created for itself a distinctive elegant, subtle and gentle beauty. Whenever you come across a lotus pond in Vietnam, that image will be hard to fade in your heart. Elegance and deep impression in your mind.